EDIT: Updated plot to a cleaned up, higher resolution version. This is a preliminary image from a research paper that we are currently putting together. It uses data from Milkyway@home's separation application! 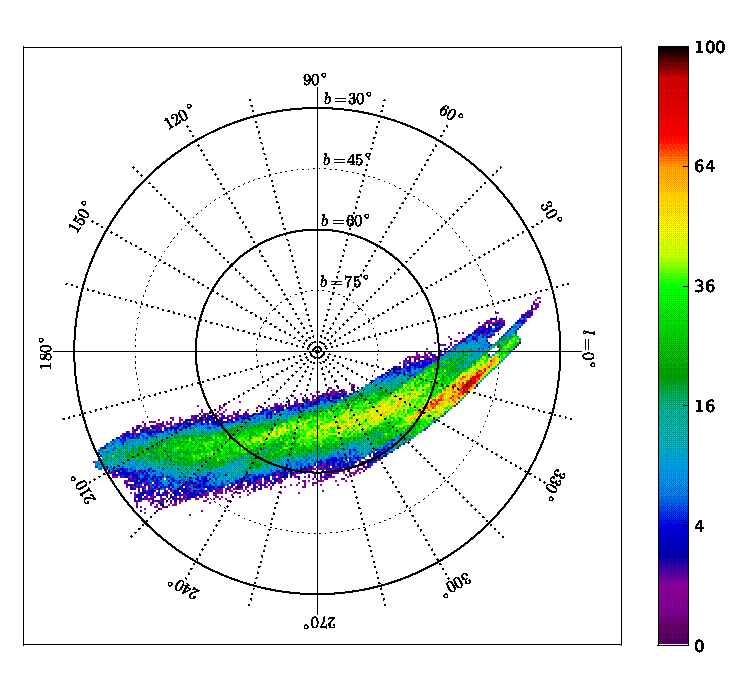 What you are looking at is a map of the Sagittarius Tidal Debris Stream, as seen by looking "up" out of the disk of our galaxy. The coordinates are in "Galactic Latitude (l) and Longitude (b)" - "l" runs along the disk of the galaxy, with 0 degrees as the line from the Sun to the galactic center, and "b" is the angle above the plane. (It's just like Latitude and Longitude on Earth, but with the Sun t the center and on a galactic scale). The colors represent the square root of the number of stars (it will be the actual number in the final plot). A summary of (l,b) can be found here. What we've done ("we" including all of you here at Milkyway@home) is fit our statistical model to the Sloan Digital Sky Survey star data, and then using the Separation code, we removed the Sagittarius Tidal Stream from the background of Milky Way galaxy stars. The Sagittarius Tidal Stream is part of the Sagittarius Dwarf galaxy, which is currently "falling into" the Milky Way galaxy. As it falls into the Milky Way, tidal forces stretch out the loose stars in a massive stream stretching all the way around the galaxy. Over time, these stars will eventually merge with the other Milky Way stars - We are "gobbling up" the Sagittarius Dwarf! In fact, many of the outer stars in our galaxy may have been "cannibalized" from other galaxies in this way! This map will help us understand the distribution of mass (*ahem* Dark Matter) in our galaxy, as well as provide insight into the formation history of galaxies in general. I'll post up a link to the paper as soon as we submit it to the reviewers! As a side note: light from the stars in the Sagittarius Stream took between 50,000 and 130,000 YEARS for the light to reach us (depending on where along the stream you look)! That is, these stars are about that many light years away from us! This does mean that the stream has had several thousand years to move before the light gets to us, but it is so massive and far away that hundreds of thousands of years are nothing to it. Streams this big and far away change on the order of ten of millions and billions of years! So we are pretty safe in saying that the stream still looks pretty much the same today. Thanks for posting this. It's always interesting to see the actuall scientific results of all that crunching, it gives that "yeah, it was worth it" feeling. Maybe someone will put your data into a plugin for Celestia (nice free 3d space simulator). I wonder what will become of the billions of possible stray planats zooming around in our galaxy. They can't be seen, so they are a kind of "Dark Matter" but not the Dark Matter which scientists search for. Are there plans to simulate other galaxies to confirm your model works as observed? Andromeda, or some head on galaxies. Message 54740 - Posted: 9 Jun 2012, 17:55:01 UTC - in response to Message 54733. Excellent! It is interesting there is a star "hot spot" that is present on (I presume) the leading edge (direction of rotation) of the stream. What is interesting is that the hot spot is not on a the neutral axis of the stream, that is, it is to the outside. Is that because centripetal accelerations are high and pushing them towards the outside of the center line? I would expect the inside of the stream to have a high star density as it would be experiencing the same centripetal accelerations and shove all the stars together. Also, the stream tip should be artificially compacted as the leading edge of the stream is thinned out and elongated (much like a comet and tail). It is curious that there is a low star density area on the inside of the steam as well as ahead of the steam. Are there other things at work I am missing or is the stream young in formation and hasn't had time to arrange itself as one would expect? Or, is it the very real possibility that I am wrong on all counts and expectations? Glad you are ok. Thanks for the update; much appreciated. Edit: I forgot to add the 3D component to the plot. So, the stream is not planar and curls so the low density "inside edge" as I referred to it, is actually behind the leading edge in terms of direction of travel. Therefore it seams the hot spot is acting like the comet center and everything else is the dust trail so to speak. Message 54777 - Posted: 13 Jun 2012, 22:20:35 UTC - in response to Message 54740. The leading edge of the tidal stream is actually on the left side of the plot - the density increases (redder) as you approach the dwarf galaxy core. This is only the part of the stream that we have data for - so it cuts off on the right edge pretty noticeably. The tidal stream actually wraps all the way around the galaxy, with "tails" in front and behind the Sagittarius dwarf galaxy - similar to a comet, if the comet also had a tail sticking out in front of it. This happens due to the "tidal" effects of our Milky Way Galaxy's gravitational pull. James Bullock has some nice images of simulations that demonstrate this; I'll try to find more in the near future.